Padmashri brush made with Dupont™ filaments absorb less water hence provide more paint pick-up and releases paint over time. Failure to adequately clean a brush can cause a buildup of paint in the heel of the brush, causing the brush to become stiff, so clean the brush each time with warm water and mild soap. A painter’s comb (like a wire hair comb) can also be used to spread the filaments during cleaning. For excessive paint buildup, use turpentine, thinner or other commercial cleaner to clean away excess paint. Shake dry. Between painting, store the brush horizontally on the paint container (not vertically). After painting, clean the brush, cover it with a paper and store it in keeper (wrapper). 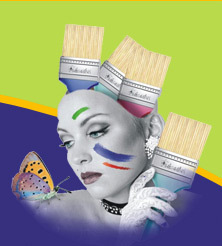 Using the above methods for use and cleaning of paint brushes will greatly improve their lifespan.